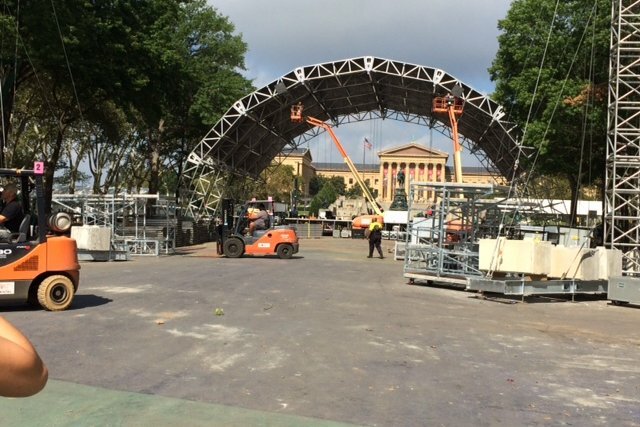 An arch over what will be a stage and then an altar went up overnight on the Eakins Circle on the Parkway. According to a contract released by Mayor Michael Nutter's office Monday, the World Meeting of Families will reimburse Philadelphia approximately $12 million for costs related to the pope's visit this weekend, Philly.com reports. The contract, which was signed Friday between the city and the nonprofit organization, states that the World Meeting of Families was to have already paid the city a security deposit of $2.5 million on Sept. 14, as well as $230,000 in license fees to use permitted locations, like the Benjamin Franklin Parkway. A breakdown of the city's cost estimates shows nearly $5 million for police and nearly $4 million for the fire department and emergency medical services. A detailed invoice for all costs and expenses is due by Nov. 1, and the World Meeting of Families must reimburse the city by Nov. 30.